As of very recently, Arsenal and Tottenham are both now in possession of cavernous, gleaming new mega-stadiums with capacities up around the 60,000 mark, situated four miles apart in north London. However, had a curious plan forged in 1977 come to pass, the two rivals might have found themselves in considerably closer proximity. Around about that time, Alexandra Palace had fallen into a state of grim disrepair and, while it was still used to host events and concerts, concern was growing over the mounting cost of keeping the venue open and the strain of maintaining the “people’s palace” and its site. Redevelopment was strongly considered as a method of making ‘Ally Pally’ profitable, though one suggestion attracted more ire than most. 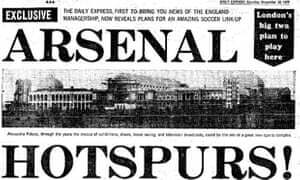 Ahead of the 1977/78 First Division season, the Daily Express revealed that, as part of the discussion, an idea had been floated that the palatial Victorian building be knocked down and its foundations repurposed as a “visionary” football stadium to be shared by Arsenal and Spurs – a “great new sport complex”. The Guardian have more details, with claims that the 75,000-seater stadium would provide the centre piece of a £20million plaza that would have included an ice-skating rink, an events hall and various other shops and restaurants. The plans included a monorail, ferrying commuters from Finsbury Park or central London up the hill to the new stadium, a futuristic mode of transport that would surely have superseded mere trains as soon as it was put in place. Unfortunately, due to being almost entirely logistically and financially unfeasible, the San Siro-esque ‘Arsenal Hotspurs Stadium’ never came to be. It wouldn’t have been the first time Arsenal and Spurs had shared a ground, with the former staging several games (around 30, in fact) as the “home side” at Highbury during World War I after seeing White Hart Lane transformed into a weapons/gas mask factory by the British War Department. Then, during World War II, Arsenal were made temporarily homeless when Highbury was requisitioned as an ARP air raid training garrison. With Spurs owing their rivals a debt of gratitude, the offer was extended and Arsenal played several local wartime championship matches on ‘enemy soil’ in 1939 and 1940.